SPRCS Students elect representatives to ACFSC. Home » Community and Society » Education » SPRCS Students elect representatives to ACFSC. 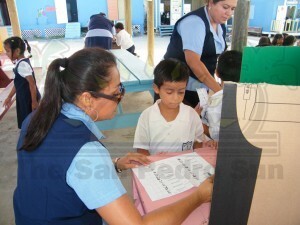 Over 900 students at the San Pedro Roman Catholic School (SPRCS) will have a chance to practice their right to vote for the first time on October 17, 2012. The students are voting to choose two student body representatives that will sit on the Quality Child Friendly School Committee QCFSC. The committee will be made up of two student body representatives, a teacher, a member of the Parent-Teacher Association, a member from the school’s management, and the businesses community among other stakeholders. On the committee, the student body representatives will be directly responsible of voicing the student body’s concerns as well as suggestions on how to improve their educational experience through an improved quality of school. Some 18 students from the upper classes; Standards four, five and six are vying for a chance to represent the student body on the QCFSC committee. Jennessa Sierra is a student of the Upper Division at SPRCS and is vying for a chance to represent her fellow students on the QCFSC. A confient Jennessa spoke to The San Pedro Sun about the elections. “I think it’s a very good plan because then our school will have direct leadership and you know – our leader, whoever they pick is going to make sure the school is good, I believe it’s gonna get better. They are going to improve the quality in our education. What am I looking for in the person that I vote for? Well, their leadership traits, that they are not shy, that they can speak up and that they are very confident in themselves. If elected I hope to bring attention to the five-a-side court. It’s not very safe. It has wood, nails and rocks and I really want to fix that because more than half of the school really enjoys football. I’ve seen that. I used to play. It’s a good sport. Apart from that, I’d really like to see something done with our garbage disposal. It is the first thing you see when you walk into our school and it is not a pretty site. I would like to see us having a proper garbage disposal.” Spoken like a true, aspiring politician. The QCFSC should be in full swing by the end of November. Lagoon – Reef Eco Challenge Begins. 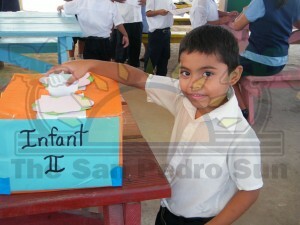 Children Rally in San Pedro!!! !